Ileana Rivera, senior director of IT for Latin America for Cisco Systems, Inc. 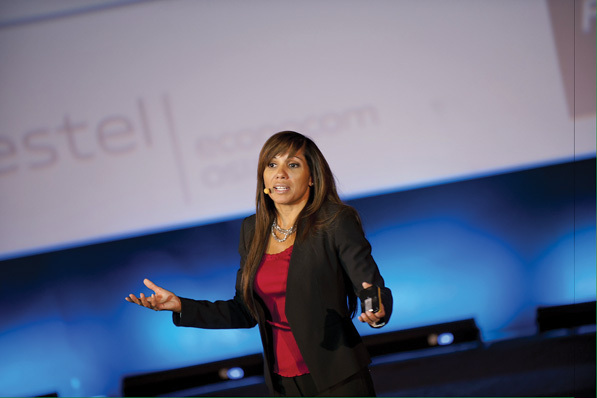 I have three major passions in life: technology, mentoring Hispanics, and supporting women. As the director of IT for Latin America at Cisco, I get to combine my passions every day. Technology has the ability to impact communities around the world. My team and I manage all IT-related client interactions and support the entire user community in Latin America, a region that brings Cisco $2 billion in revenue. I explain how we use and implement technology, make sure our network and applications are working properly, and offer support. I usually travel once a month and talk to clients around the world through the use of Cisco’s collaboration technologies. I recently presented to nearly 2,000 customers and partners during the Cisco Connect Madrid event and went to Argentina and Chile for Cisco’s CIO Summits to talk about recent technology transitions. I’m also supporting the launch of our Mexico support center and preparing for the 2016 Olympics in Brazil, where Cisco will be a sponsor. Through Cisco’s Program Escuela, we work with kids around the world. The program connects groups of students via Cisco Telepresence video conferencing to share their experiences designing the “city of the future.” This amazing program has been one of my most fulfilling experiences at Cisco. Collaborating with people all over the world and cultivating relationships make my job so interesting and fun. As Hispanics, I believe we can do so much to help each other grow and become better leaders. When I first came to the United States in 1997, my biggest challenge was learning English as a second language. When people couldn’t understand me, they often assumed I wasn’t intelligent. So, I went back to school and studied English as a second language for two years and read as many books as I could get my hands on. I see every challenge as a math problem; there’s always a solution, even if it takes time to figure it out. I serve on the board for Conexion, Cisco’s Latino employee resource group (ERG), which provides opportunities to mentor, coach, and advise other Latinos. I also serve on the board of the Hispanic IT Executive Council (HITEC). I’m involved in HITEC’s Emerging Executive Program, which helps IT leaders become the next generation of business executives. It’s an honor to work side-by-side with global IT executives representing the biggest technology firms in the world and to share my knowledge with emerging executives. Professional development helps all of us be better at our jobs. In Latin America, though, change moves at a different pace. Women still don’t have as many opportunities as men. I have a responsibility to talk to women and share my story. I want young girls to know that they can wear high heels and love fashion like I do and still have a career in business, engineering, or technology. They can be themselves without giving anything up. I coach and mentor 17 women who are in turn helping me to stay grounded. The more I talk to my mentees, the better a leader I become. I’m also an active member of Connected Women, Cisco’s ERG dedicated to the advancement, mentoring, and promotion of women. We provide opportunities for networking and development, and we have a program for young professionals to shadow a female executive for a day. Looking back at my humble beginnings in Puerto Rico, I’m amazed by where I am now. I lived a simple life and was the youngest of seven daughters. When I went to the University of Puerto Rico, I had one professor who didn’t support my aspirations to be an engineer because I’m a woman. That pushed me to try even harder to succeed and graduate as an engineer. Now I feel like I’ve achieved my version of the American Dream. I’m proud of who I am and where I come from. At Cisco, I feel free to be myself. I always tell other Latinas and Latinos that if a company doesn’t embrace diversity, that’s the company’s problem. I would never change my name or hide who I am in order to fit in. Authenticity is the most important quality in a leader. Don’t ever change who you are to be successful.